ArtNET is the perfect way to send and receive many DMX universes or to connect multiple lighting consoles together. Since it uses the network to transmit and receive data, no special DMX cable and converter are needed. You only need those when you want to send actual DMX values to your lighting fixtures. Then you buy ArtNET to DMX interfaces (also named ArtNET nodes) and plug them anywhere on your network. With ArtNET, you can even use a wireless network (WIFI) and any other common and low priced ethernet gadgets you find these days. ArtNET is already an industry standard and more and more lighting equipment will support it in the future. Lightjams Recorder is a record & playback solution for up to 512 DMX universes. The ArtNetominator can help you troubleshoot your ArtNet problems. Totally free! ArtNET™ Designed by and Copyright Artistic Licence Holdings Ltd.
64 universes that is 32768 DMX channels for you to create with. Lightjams can really be the work horse of your show and talk directly to your DMX 512 fixtures. Easily receive commands from other lighting consoles over ArtNET. You can map any DMX values to Lightjams parameters in a few clicks. The ArtNET input panel shows you all DMX addresses at once, and this in real time. When using a wireless network to transmit ArtNET data, you absolutely need to use the unicast feature (sending ArtNET to specific IP addresses). The reason is that broadcasting very rapidly overloads a wireless network. With ArtNET and Lightjams, you'll be able to send data directly to the nodes you want and get great performance even when sending multiple universes. You can use the really affordable DMXKing eDMX1 to get the DMX to your lights for under $150. Lightjams supports all ArtNET versions from 1 to 4. It plays really well with other DMX lighting consoles and respects the ArtNET specifications. Access the ArtNET configuration by going to View/Configuration. In the ArtNET 3 terminology, Lightjams is always on Net 0. You can change the subnet. Network: Here you can change the default ArtNET UDP port (which is 6454) and select your network card if you have multiple. The loopback adapter (127.0.0.1) can send and receive ArtNET in the computer only. Input: Select your input subnet. 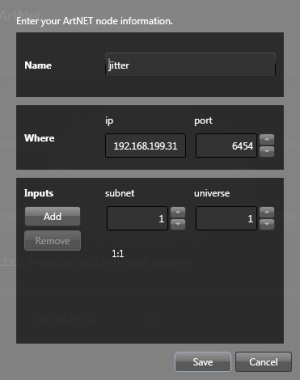 All 16 universes of this subnet will be available as DMX input values. Output: Select your output subnet. 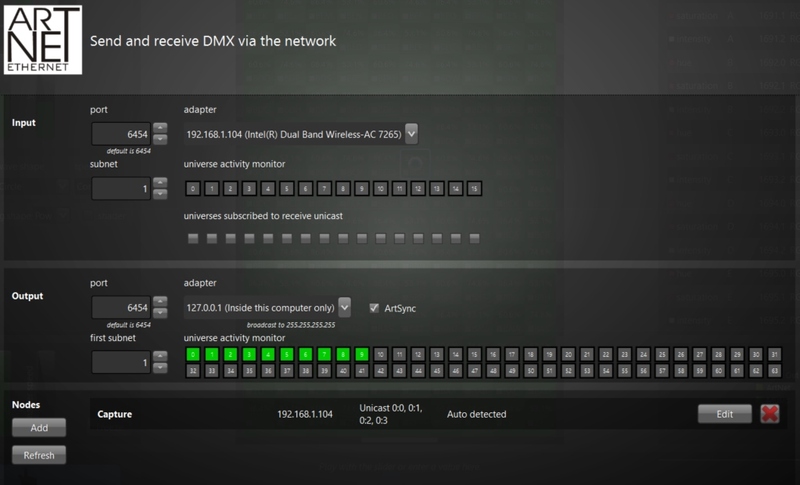 All DMX fixtures patched to the ArtNET universes will be outputted in this subnet. ArtSync: Activate this option to sync the outputs of all ArtNET nodes (need to be ArtSync compatible). This is useful when controlling lots of LEDs. Nodes: Lightjams automatically detects other ArtNET nodes at startup. A node can be a DMX console, an ArtNET to DMX device or any other ArtNET enabled equipment. For each node, you see its name, ip and subscribed unicast universes. Hit the refresh button to look for new nodes. Your best friends when it comes to troubleshooting the ArtNET underworld. Networking can be so obscure sometimes. You have two monitors: One for the 16 input universes and another for the 64 output universes. Input: See what's coming in. Output: See what's going out. Universe status: When there is activity in a universe (DMX in or out), the LED status turns green. ArtNET II introduced UDP unicast to achieve significant network efficiency gains. In order to use unicast, ArtNET II compliant nodes have to subscribe to universes. When there is no subscription, Lightjams will fallback to the broadcast mode to allow backward compatibility with older ArtNET nodes. Note that broadcasting is particularly inefficient when using a wireless network. So with a wifi, ArtNET II supports of unicast is a must. You can manually add a node by clicking the add button. This is handy to send ArtNET to a custom made application or to override the information a node is automatically sending. For example: This lets you subscribe to universes and enable unicast sending. Name: Give the node a nice name. Where: Specify the ip address and the UDP port. ArtNET DMX data will be sent there using UDP unicast. Inputs: Subscribe to universes to enable unicast sending. Lightjams will merge all incoming DMX data in the same universe from multiple sources by using the LTP (latest takes precedence) method. While ArtNET calls for a maximum of two nodes when it comes to merging, any number of nodes can send ArtNET DMX data to Lightjams at the same time. Select any slider and click on the DMX icon. Then you'll be able to play with all ArtNET settings. Universe: Select your universe. All DMX data from the 16 universes of the selected input subnet are available. DMX values: The viewer at the left lets you see DMX values in realtime and easily choose the value you want. Just click a value to select it.